Does Accounting certification affect compensation? Yes it does, but how far? A new salary survey by the Institute of Management Accountants (IMA) has found that Certified Public Accounting (CPAs) and Certified Management Accountants (CMAs) earn significantly more than those without certification. IMA’s Annual Salary Survey explores salary trends of accounting and finance professionals and reveals that certain industries are faring better than others. 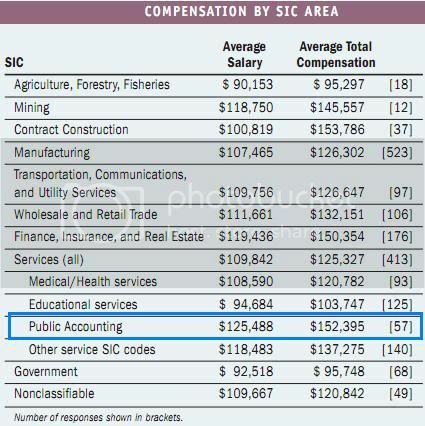 Public accounting ranked first in terms of average salary, at $125,488, and second in average total compensation, at $153,395, both in 2010 and 2009. The survey was mailed to respondents last December, and the results have just been released this month. Certification is very important to many accountants for various reasons. IMA pointed out, 72% of the respondents have some kind of certification, and their average salary is $114,980, a $1,300 increase from last year’s $113,680. The 28% of respondents without any certification report an average salary of $95,823—a difference of more than $17,000, which is statistically significant. Similar differences occur with average total compensation: The average total compensation for those with certification is $135,695, which is over $27,000 more than those without certification ($108,938), and this difference is also statistically significant. Of note, however, is that salary and total compensation for certified respondents increased about 1% this year, but it also increased 9% for those who aren’t certified. The compensation of individuals who hold some form of certification—CMA (Certified Management Accountant), CPA (Certified Public Accountant), or both (CMA and CPA)—earn more than those without any certification overall and for each of the five age categories presented in the table. Similar to the past five years, the average compensation tends to increase for each age category up to the 50-59 group. Over the past five years, the “60 and over” category has swapped positions with the 50-59 age group. In 2005, 2006, and 2009, those respondents 60 and over made more than those 50-59. This year, the “60 and over” group slipped in some certification categories as those with the CMA alone and both CPA/CMA earned less than the respective 50-59 age group. There are 27% more respondents 60 and over than last year, which could indicate the recovery kept and maybe even brought back older IMA members into the workforce. For all five age categories, the column representing those with no CMA or CPA is less than the three columns showing the compensation for CMAs, CPAs, and those with both. Thus the differential of having professional certification follows individuals throughout their careers and affects their earning power. As in previous years, the dollar amount of the “certification bonus” appears at the very beginning of respondents’ careers and increases with their age. Certified individuals who are 19-29 earn $14,129 more salary than their noncertified peers and $15,005 more total compensation. This grows to $21,321 more salary and $32,535 more total compensation for those who are 50-59. The total-dollar pattern follows that of prior years, but the proportion of the certification bonus changed for several age categories this year. Certified respondents who are 19-29 saw an increase in both salary and total compensation from around 22% in 2009 to approximately 27% in 2010. Those in the 30 to 59 age groups earned 15%-20% more than non-certified respondents, but this is a drop of 6%-11% from last year. The total compensation of those 30-49 was about 17% more than those who aren’t certified, a drop of 10%-13% from last year. Total compensation for the 50-59 category remained about 28% for both years. The most dramatic shift occurred for those 60 and over: The certification bonus was 35% for salary last year but only 10% this year, and total compensation was 46% higher for certified respondents last year but was only 10% higher this year. This year, both CMA and CPA returns to the top spot with a little more than $120,000 in salary and just under $145,000 in total compensation. The CPAs reported $115,000 in salary and just over $131,000 in total compensation, and the CMAs reported $111,000 in salary and virtually the same $131,000 in total compensation as CPAs. Historically, the amount of the difference from top to third has ranged from $7,000 to $20,000 in salary and from $8,000 to $25,000 in total compensation. 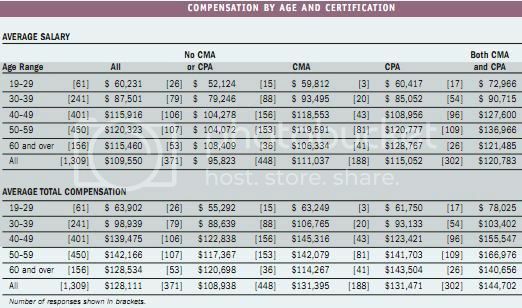 Contrary to what they shown last year with the CPA group possibly inching ahead, the only age category where the CPA has more than a $1,500 advantage in either salary or total compensation is “60 and over.” Conversely, CMA and CPA respondents are in a virtual tie in the 19-29 and 50-59 age categories, but CMAs report a more than $10,000 benefit over the CPAs who are 30-39 and 40-49. This pattern of CMA strength in the 30-49 range didn’t exist last year, so it may be too soon to know if this is the new trend. Also notable is the “double bonus” of having both certifications in the 19-29 category. There are only 17 double-certified young respondents this year, and only 10 last year, but this pattern has been consistent over time and is consistent with the salary calculator at the end of the article. Given the time value of money and compounding interest over the span of a person’s career, getting certified early (and often) makes tremendous economic sense. All of the differences in average compensation between certification and no certification are statistically significant, but the differences in average compensation by type of certification aren’t conclusive because there are a large number of dual certifications (e.g., CMA/CPA and CMA/CFM). How Does Accounting Degree Affect Compensation? The next table (by IMA) shows the number of respondents at the various educational levels as well as the average compensation for each of these four categories. As in the past, average compensation usually increases with degree level. Respondents who have no degree (only 0.4% of all respondents) saw large increases of $13,000 in salary and $29,000 in total compensation, and they earned more than those with baccalaureate degrees. Those with doctorates (4.7% of this year’s respondents) earned the most overall and had the biggest change in salary—an increase of $14,401 vs. a decrease last year of $13,650 and an increase in total compensation of $25,836 vs. last year’s decrease of $31,200. 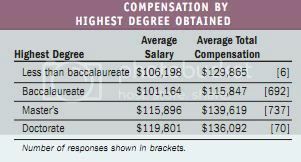 As in the past, the average compensation amounts by degree are statistically significant in 2010. Young & Rich: Why Aren’t They Accountants, But Tech? CPA is sixth-best Job in America 2009 [With Ranks]!